I know I’m in the minority group when it comes to actually enjoy living on a budget. A lot of people don’t like budgeting or find it unnecessary and that’s a shame. Budgeting has really helped me regain control of my money, meet financial goals and live a better life. Before I started taking budgeting seriously, I had no idea what was going on with my money or how to get out of debt. 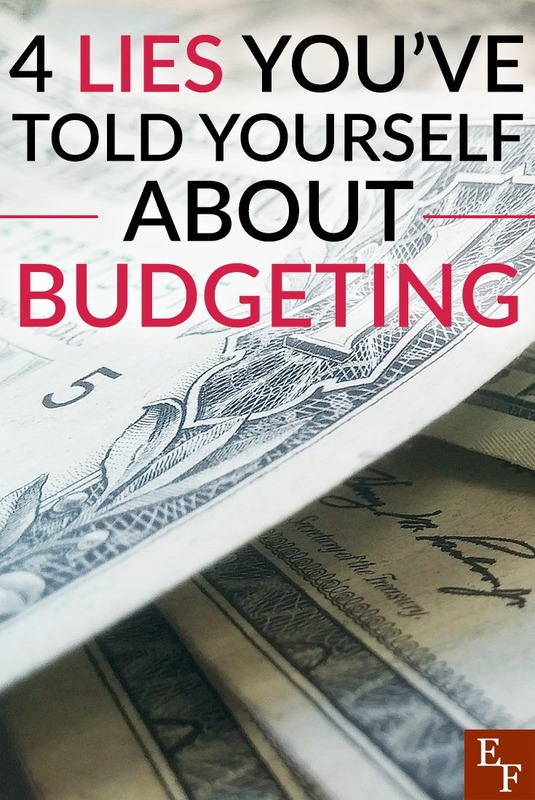 These days, the word ‘budget’ is often surrounded by a lot of negativity and I believe that’s people have told themselves lies about what budgeting truly is. Here are 4 lies you might have told yourself about budgeting in the past. These lies could be holding you back from a better financial future. As a financial coach, I’d conversations with many people (clients and non-clients) who feel their finances are not in a dire condition. Some people may not be struggling but still feel like they could benefit from some extra income or realistic savings strategies. If you’re paying your bills on time and making ends meet, you may not think you need to budget but that’s a lie you shouldn’t tell yourself. I know some people who seem well off on the outside but have no idea where their money is going. Budgeting isn’t just for people who are broke or struggling. It’s a solution to help bring structure to your finances and allow you to keep better track of what goes in vs. what goes out. What if you’re making ends meet but are actually overspending in several areas and haven’t been able to meet certain goals as a result? Sometimes what we think we spend and what we actually spend are two completely different figures. Having a budget could help you reign in your unnecessary spending and better allocate your money. Budgeting is only as hard as you make it. One thing people do that make the process difficult is to procrastinate. If you put off creating a budget, you will trick yourself into thinking it’s too challenging and difficult to work on. Living on a budget is also not that hard when you really think about it. First off, your budget should be realistic and apply to your current situation. This is why I always recommend tracking your expenses first and cutting unnecessary spending categories. If you’ve been living above your means and putting everything on credit for years, it can seem difficult to start managing the money you actually have. Putting together a realistic budget will help with this because you can create whatever categories you want and play around with the figures to see what fits. I’m not going to lie, it does take time to budget properly. However, what makes you so sure that you don’t have the time? Also, what are you doing that is so important you no longer have time to manage your money? It’s pretty counterproductive to say you don’t have time to budget if you have time to spend money, get into debt, cash your paycheck, and file taxes. We may not want to do all of those things but we make time in our schedules to do them. If you find time to spend money, you should be able to find time to budget and create a plan for your money as well. Start by blocking out time in your calendar to go through your finances and create a budget that works for you. This first step may be time-consuming but once you get a budget in place, you can spend a few minutes each week doing maintenance and tracking your spending. The key is to avoid letting your finances get so bad that you have to spend hours on end trying to track everything down and understand what’s going on. This lie may stem from your past. Maybe you’ve tried budgeting in the past and found that you felt limited. Or, maybe your childhood experiences helped contribute to this fallacy. When I was growing up, my sister and I would remember our mom always telling us that she was on a budget or fixed income whenever we went grocery shopping. To us, that would mean we couldn’t get any of the good food and snacks we really wanted. It made us feel like our options were limited. It can feel the same way when you’re trying to have fun and enjoy life. Some people may steer clear of budgeting because they think it means they can’t go out to happy hour twice a week. On the contrary, your budget allows you to get real and be honest with yourself. Maybe you can’t afford happy hour twice a week, but you can cut down to once a week and do something else with friends to make up for it. There are plenty of ways to have fun on a budget. I actually think you can have more fun and still meet your financial goals when you use a budget. At the end of the day, if you’re not budgeting, you’re probably living in a fantasy land in terms of your finances. If you aren’t keeping track of income and expenses and fail to make a plan for your money, you won’t make any progress long-term. It can also be scary to go month after month wondering if you can pay your bills or if you’ll have extra money to put toward a certain goal. I encourage others to stop seeing budgeting as a problem and start to see it as a solution. I also encourage others to budget for fun, entertainment, and the expenses that they value. Your budget should be realistic and reflect your lifestyle and goals. There’s no right or wrong budget and everyone’s will be different. What are your thoughts on budgeting? Have you ever told yourself any of these budgeting lies? I prefer tracking to budgeting. Tracking involves writing down all of your spending to the penny, this is something that I’ve done for 7 years so far. I find that the simple act of writing down the spending forces you to question whether you actually need to make the purchase. I transfer all of my spending into a spreadsheet each week – it’s amazing what trends emerge. I prefer tracking my actual spending as opposed to budgeting what I might spend – for some reason I find it easier. Try it!